Our custom guitars are unique instruments that are hand crafted based on customer preferences and needs. We work intimately with the customer throughout the building process in order to produce their ideal instrument. Custom guitars are available upon request. 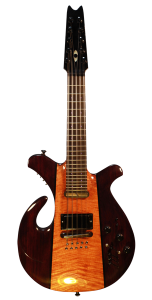 Featured guitars are examples of previous custom orders; click on the images for more pictures and detailed specifications.